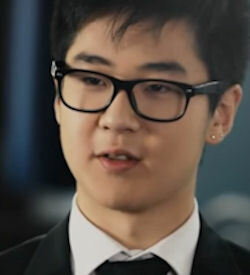 Kim Han-sol is the son of North Korean leader Kim Jong-un’s half-brother, Kim Jong-nam, and the grandson of Kim Jong-il. In constrast to Kim Jong-un, who was little more than a rumor a couple of years prior to assuming power, Kim Han-sol is very well attested. Born in Pyongyang in 1995, he never met his grandfather. 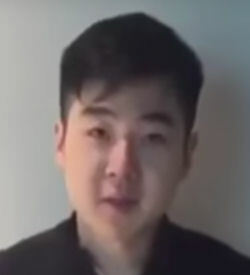 Kim Han-sol moved to Macau after his father reportedly fell out of favor with his grandfather Kim Jong-il in the early 2000s, and is reportedly a graduate of France's prestigious Sciences Po university. Kim Han-sol is believed to be the last surviving male of the "Baekdu" descent flowing from North Korean state founder Kim Il-sung to Kim Jong-il and his father Kim Jong-nam. In most descriptions of Kim Jong Un in official North Korean communications, the phrase, “Baekdu hyultong,” or Baekdu bloodline, appears. Mount Baekdu is the place where North Korean founding leader Kim Il Sung supposedly fought against Japanese occupation forces, and where his son Kim Jong Il was supposedly born. Or so North Koreans are told to believe. In August 2013 North Korea revised the 10 fundamental principles of the ruling Workers’ Party to legitimise the hereditary succession of current leader Kim Jong-un and his family. The revised rules stipulate that North Korea and the Workers’ Party will be “kept alive forever by the Baekdu bloodline”. The English-language South China Morning Post reported 11 October 2011 that the 16-year-old Kim Han-sol had been accepted by the international United World College in Hong Kong, but that his visa bid was rejected by the city's immigration department despite several requests. United World College, an international high school with a very good student to teacher ratio has 13 schools in different locations across the world. Hong Kong immigration authorities refused direct comment on the report. But they acknowledged that entry visas for study do not apply to nationals from certain countries, including North Korea, and said such applications are considered on an individual basis. As of 2012, he was studying at United World College in Mostar. United World College did not explicitly confirm that the student it was accepting was a grandson of Kim Jong-il. "The entry of a student from North Korea, furthermore from a very well-known family, has understandably generated surprise and comment, some of it critical," it said in a statement. At that time Kim Han Sol and his mother and sister were safe in Beijing under protection of the Chinese. The grandson of Kim Jong-il speaks perfect English with an American accent. He seems like a very smart and intelligent guy. Kim Jong-un, Kim Jong-nam and their sister Kim Jong-chul well all privately educated in Switzerland. Kim Jong-un speaks fluent German and excellent English. While in Switzerland they lived in a very modest 3 bedroom apartment in a very clandestine manner. During a rare TV interview in 2012, the young Kim called Kim Jong Un a "dictator". His reply to a question why his uncle was appointed as leader was: "My dad was definitely not really interested in politics. "I really don't know how he (Kim Jong Un) became a dictator... It was between him and my grandfather." A man claiming to be the son of the North Korean leader's slain half brother said he and his family are safe and in an undisclosed location, in a video released online 07 March 2017. "I'm currently with my mother and my sister," said the man said in a clip posted to YouTube. "We hope this gets better soon," he added. A South Korean intelligence official identified the man as 21-year-old Kim Han Sol, the son of Kim Jong Nam's second wife. Kim Han-sol was believed to be living in an apartment in Macau with his mother Ri Hye-kyong and his 19-year-old sister Kim Sol-hui under China's protection. Kim Jong-nam's son Kim Han-sol reportedly arrived at the mortuary of the Kuala Lumpur hospital 21 February 2017 and confirmed the body was that of his father. Major media outlets in Seoul say, Kim Han-sol disguised himself as a special police officer on his way in and out of the hospital to conceal his identity. During his hour-long stay, Kim also reportedly underwent some tests to determine whether his DNA matches Kim Jong-nam's. Kim Han-sol's trip to Malaysia came a day after Malaysian authorities said they would only release Kim Jong-nam's body to direct family members whose ties with him could be proven through a paternity test. If the DNA is a match, Kim Jong-nam's direct family members will be able to claim his body. North Korea protested the move, as it wanted to take the body back to Pyongyang. If son Kim Han-sol claimed his father‘s corpse, at least three possible interment sites could be named. The first is in North Korea, birthplace of both Kim Jong-nam and Kim Han-sol. This possibility appeared slim, given that North Korea has been mentioned as possibly behind Kim Jong-nam’s assassination. A second possibility was Macao, where Kim Jong-nam’s second wife and Han-sol’s mother Lee Hye-kyong and younger sister Kim Sol-hui reside. In this case, the assistance and cooperation of the Chinese government would be essential. And some mentioned Malaysia, the site of the killing, as a possible alternative location for interment of Kim’s corpse.